Learn how to create a C# Apache Storm topology by using the Azure Data Lake (Apache Hadoop) tools for Visual Studio. This document walks through the process of creating a Storm project in Visual Studio, testing it locally, and deploying it to an Apache Storm on Azure HDInsight cluster. You also learn how to create hybrid topologies that use C# and Java components. While the steps in this document rely on a Windows development environment with Visual Studio, the compiled project can be submitted to either a Linux or Windows-based HDInsight cluster. Only Linux-based clusters created after October 28, 2016, support SCP.NET topologies. To use a C# topology with a Linux-based cluster, you must update the Microsoft.SCP.Net.SDK NuGet package used by your project to version 0.10.0.6 or later. The version of the package must also match the major version of Storm installed on HDInsight. C# topologies on Linux-based clusters must use .NET 4.5, and use Mono to run on the HDInsight cluster. Check Mono compatibility for potential incompatibilities. 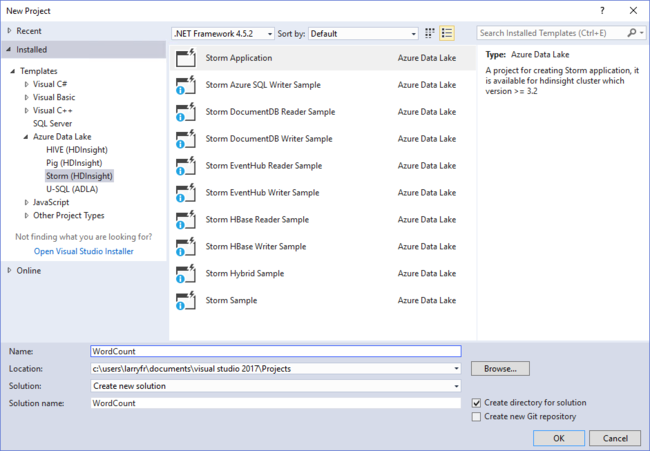 To install Data Lake tools for Visual Studio, follow the steps in Get started using Data Lake tools for Visual Studio. When you submit a Storm topology from Visual Studio, SCP.NET generates a zip file that contains the topology and dependencies. Java is used to create these zip files, because it uses a format that is more compatible with Linux-based clusters. Install the Java Developer Kit (JDK) 7 or later on your development environment. You can get the Oracle JDK from Oracle. You can also use other Java distributions. The JAVA_HOME environment variable must point to the directory that contains Java. The PATH environment variable must include the %JAVA_HOME%\bin directory. Storm Application An empty Storm topology project. Storm Azure SQL Writer Sample How to write to Azure SQL Database. Storm Azure Cosmos DB Reader Sample How to read from Azure Cosmos DB. Storm Azure Cosmos DB Writer Sample How to write to Azure Cosmos DB. Storm EventHub Reader Sample How to read from Azure Event Hubs. Storm EventHub Writer Sample How to write to Azure Event Hubs. Storm HBase Reader Sample How to read from HBase on HDInsight clusters. Storm HBase Writer Sample How to write to HBase on HDInsight clusters. Storm Hybrid Sample How to use a Java component. Storm Sample A basic word count topology. Not all templates work with Linux-based HDInsight. NuGet packages used by the templates may not be compatible with Mono. Check the Mono compatibility document and use the .NET Portability Analyzer to identify potential problems. In the steps in this document, you use the basic Storm Application project type to create a topology. The HBase reader and writer templates use the HBase REST API, not the HBase Java API, to communicate with an HBase on HDInsight cluster. The Java-based EventHub spout component included with the EventHub Reader template may not work with Storm on HDInsight version 3.5 or later. An updated version of this component is available at GitHub. For an example topology that uses this component and works with Storm on HDInsight 3.5, see GitHub. Open Visual Studio, select File > New, and then select Project. From the New Project window, expand Installed > Templates, and select Azure Data Lake. From the list of templates, select Storm Application. At the bottom of the screen, enter WordCount as the name of the application. Program.cs: This file defines the topology for your project. A default topology that consists of one spout and one bolt is created by default. Spout.cs: An example spout that emits random numbers. Bolt.cs: An example bolt that keeps a count of numbers emitted by the spout. When you create the project, NuGet downloads the latest SCP.NET package. For more information on components provided with HDInsight, see HDInsight component versions. NextTuple: Called by Storm when the spout is allowed to emit new tuples. Ack (transactional topology only): Handles acknowledgements initiated by other components in the topology for tuples sent from the spout. Acknowledging a tuple lets the spout know that it was processed successfully by downstream components. Fail (transactional topology only): Handles tuples that are fail-processing other components in the topology. Implementing a Fail method allows you to re-emit the tuple so that it can be processed again. Replace the contents of the Spout class with the following text: This spout randomly emits a sentence into the topology. "i am at two with nature"
Delete the existing Bolt.cs file from the project. In Solution Explorer, right-click the project, and select Add > New item. From the list, select Storm Bolt, and enter Splitter.cs as the name. Repeat this process to create a second bolt named Counter.cs. Splitter.cs: Implements a bolt that splits sentences into individual words, and emits a new stream of words. Counter.cs: Implements a bolt that counts each word, and emits a new stream of words and the count for each word. These bolts read and write to streams, but you can also use a bolt to communicate with sources such as a database or service. Open Splitter.cs. It has only one method by default: Execute. The Execute method is called when the bolt receives a tuple for processing. Here, you can read and process incoming tuples, and emit outbound tuples. // Do we already have an entry for the word in the dictionary? Sentences are emitted from the spout, and are distributed to instances of the Splitter bolt. The Splitter bolt breaks the sentences into words, which are distributed to the Counter bolt. Because word count is held locally in the Counter instance, you want to make sure that specific words flow to the same Counter bolt instance. Each instance keeps track of specific words. Since the Splitter bolt maintains no state, it really doesn't matter which instance of the splitter receives which sentence. // Add the spout to the topology. // Add the splitter bolt to the topology. // Add the counter bolt to the topology. In Solution Explorer, right-click the project, and select Submit to Storm on HDInsight. If prompted, enter the credentials for your Azure subscription. If you have more than one subscription, sign in to the one that contains your Storm on HDInsight cluster. Select your Storm on HDInsight cluster from the Storm Cluster drop-down list, and then select Submit. You can monitor if the submission is successful by using the Output window. When the topology has been successfully submitted, the Storm Topologies for the cluster should appear. Select the WordCount topology from the list to view information about the running topology. You can also view Storm Topologies from Server Explorer. Expand Azure > HDInsight, right-click a Storm on HDInsight cluster, and then select View Storm Topologies. To view information about the components in the topology, double-click the component in the diagram. From the Topology Summary view, click Kill to stop the topology. Storm topologies continue to run until they are deactivated, or the cluster is deleted. The previous topology is non-transactional. The components in the topology do not implement functionality to replaying messages. For an example of a transactional topology, create a project and select Storm Sample as the project type. Metadata caching: The spout must store metadata about the data emitted, so that the data can be retrieved and emitted again if a failure occurs. Because the data emitted by the sample is small, the raw data for each tuple is stored in a dictionary for replay. Ack: Each bolt in the topology can call this.ctx.Ack(tuple) to acknowledge that it has successfully processed a tuple. When all bolts have acknowledged the tuple, the Ack method of the spout is invoked. The Ack method allows the spout to remove data that was cached for replay. Fail: Each bolt can call this.ctx.Fail(tuple) to indicate that processing has failed for a tuple. The failure propagates to the Fail method of the spout, where the tuple can be replayed by using cached metadata. This code emits a tuple that contains a sentence to the default stream, with the sequence ID value contained in lastSeqId. For this example, lastSeqId is incremented for every tuple emitted. As demonstrated in the Storm Sample project, whether a component is transactional can be set at runtime, based on configuration. You can also use Data Lake tools for Visual Studio to create hybrid topologies, where some components are C# and others are Java. Java spout and C# bolt: Defined in HybridTopology_javaSpout_csharpBolt. A transactional version is defined in HybridTopologyTx_javaSpout_csharpBolt. 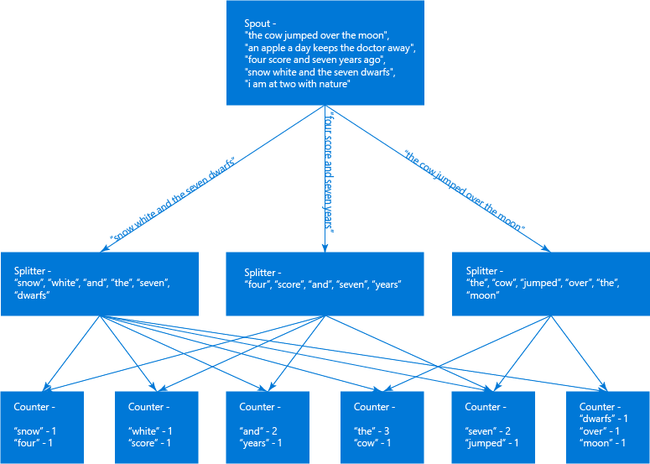 C# spout and Java bolt: Defined in HybridTopology_csharpSpout_javaBolt. A transactional version is defined in HybridTopologyTx_csharpSpout_javaBolt. This version also demonstrates how to use Clojure code from a text file as a Java component. To switch the topology that is used when the project is submitted, move the [Active(true)] statement to the topology you want to use, before submitting it to the cluster. All the Java files that are required are provided as part of this project in the JavaDependency folder. Use JavaComponentConstructor to create an instance of the Java class for a spout or bolt. Use microsoft.scp.storm.multilang.CustomizedInteropJSONSerializer to serialize data into or out of Java components from Java objects to JSON. When submitting the topology to the server, you must use the Additional configurations option to specify the Java File paths. The path specified should be the directory that contains the JAR files that contain your Java classes. EventHubSpoutConfig class: Creates an object that contains the configuration for the spout component. TopologyBuilder.SetEventHubSpout method: Adds the Event Hub spout component to the topology. You must still use the CustomizedInteropJSONSerializer to serialize data produced by the spout. Don't use ConfigurationManager to retrieve configuration values from bolt and spout components. Doing so can cause a null pointer exception. Instead, the configuration for your project is passed into the Storm topology as a key and value pair in the topology context. Each component that relies on configuration values must retrieve them from the context during initialization. In Solution Explorer, right-click the project, and select Manage NuGet Packages. From the package manager, select Updates. If an update is available, it is listed. Click Update for the package to install it. Using the Search field, search for, and then add, Microsoft.SCP.Net.SDK to the project. When you are using a C# topology with a Linux-based HDInsight cluster, bolt and spout components that use ConfigurationManager to read configuration settings at runtime may return null pointer exceptions. The configuration for your project is passed into the Storm topology as a key and value pair in the topology context. It can be retrieved from the dictionary object that is passed to your components when they are initialized. For more information, see the ConfigurationManager section of this document. System.TypeLoadException: Failure has occurred while loading a type. This error occurs when you use a binary that is not compatible with the version of .NET that Mono supports. For Linux-based HDInsight clusters, make sure that your project uses binaries compiled for .NET 4.5. Although it is easy to deploy a topology to a cluster, in some cases, you may need to test a topology locally. Use the following steps to run and test the example topology in this tutorial locally in your development environment. Local testing only works for basic, C#-only topologies. You cannot use local testing for hybrid topologies or topologies that use multiple streams. In Solution Explorer, right-click the project, and select Properties. In the project properties, change the Output type to Console Application. Remember to change the Output type back to Class Library before you deploy the topology to a cluster. In Solution Explorer, right-click the project, and then select Add > New Item. Select Class, and enter LocalTest.cs as the class name. Finally, click Add. // components in the development environment. Take a moment to read through the code comments. This code uses LocalContext to run the components in the development environment, and it persists the data stream between components to text files on the local drive. Save the changes, and then click F5 or select Debug > Start Debugging to start the project. A console window should appear, and log status as the tests progress. When Tests finished appears, press any key to close the window. Use Windows Explorer to locate the directory that contains your project. For example: C:\Users<your_user_name>\Documents\Visual Studio 2013\Projects\WordCount\WordCount. In this directory, open Bin, and then click Debug. You should see the text files that were produced when the tests ran: sentences.txt, counter.txt, and splitter.txt. Open each text file and inspect the data. String data persists as an array of decimal values in these files. For example, [[97,103,111]] in the splitter.txt file is the word and. Be sure to set the Project type back to Class Library before deploying to a Storm on HDInsight cluster. Logged information can be viewed from the Hadoop Service Log, which is found in Server Explorer. Expand the entry for your Storm on HDInsight cluster, and then expand Hadoop Service Log. Finally, select the log file to view. The logs are stored in the Azure storage account that is used by your cluster. To view the logs in Visual Studio, you must sign in to the Azure subscription that owns the storage account. From Server Explorer, right-click the Storm on HDInsight cluster, and select View Storm topologies. For the Spout and Bolts, the Last Error column contains information on the last error. Select the Spout Id or Bolt Id for the component that has an error listed. On the details page that is displayed, additional error information is listed in the Errors section at the bottom of the page. To obtain more information, select a Port from the Executors section of the page, to see the Storm worker log for the last few minutes. Replace sshuser with the SSH user account for the cluster. Replace clustername with the name of the HDInsight cluster. For more information on using scp and ssh with HDInsight, see Use SSH with HDInsight. JDK is not installed or is not in the path. Required Java dependencies are not included in the submission. The JDK is not in the path on the development environment. Verify that the JDK is installed in the development environment, and that %JAVA_HOME%/bin is in the path. You are missing a Java dependency. Make sure you are including any required .jar files as part of the submission. For an example of processing data from Event Hubs, see Process events from Azure Event Hubs with Storm on HDInsight. For an example of a C# topology that splits stream data into multiple streams, see C# Storm example. To discover more information about creating C# topologies, see GitHub.